Students in the Catholic University School of Canon Law had a unique opportunity to spend time with Pope Francis in March, during a study abroad trip to Rome over Spring Break. The 17 students — led by Professor Kurt Martens — were spending time in Vatican City to learn about the inner workings of the Church. On the group’s last day in Rome, Martens and the students met with Cardinal Pietro Parolin, the Vatican Secretary of State, to discuss topics related to the American Church and Vatican diplomacy. Cardinal Parolin said that he would try to arrange a time when the group could meet with Pope Francis. Then, only a few hours later, Martens received a call from Cardinal Parolin saying the Pope could see them that afternoon. At the time, Martens and the group were getting ready to go to Mass at the Basilica of Saint Mary Major, where they would be joined by Callista Gingrich, the U.S. Ambassador to the Holy See. 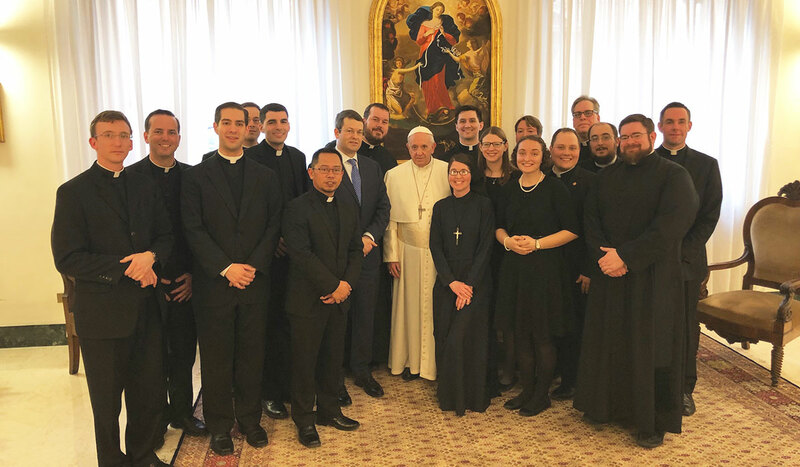 Kelly Schaffer, a second-year canon law student from Toledo, Ohio, remembers how exciting it was to hear they would be meeting with Pope Francis. She and her classmates did not know they would be meeting him until they were already on the bus driving to his residence. After running through security, Schaffer said she was surprised to find that her group was completely alone with the Pope. During their brief meeting, Pope Francis advised the students to study hard and to always look at the roots of Church laws to fully understand why he and other leaders legislate the way they do. The Pope also led the group in prayer, asking them to say a Hail Mary and giving them a blessing. Canon law student Sister Rose Marie Timmer said the encounter was “delightful” and that the Holy Father was “humorous, joyful, and pastoral.” She was particularly moved when he explained the significance of an image hanging in the room of Our Lady, Undoer of Knots. “He told us to be mindful of bringing the knots of our lives — our anxieties, the burden of our sins, and our cares — to this Mother of Fair Love,” Sister Rose Marie said. “We should not attempt to undo them ourselves lest we pull on them such that they become harder to untie, but rather entrust them to her who by her serene gaze gives loving attention to undoing each one. “The Holy Father encouraged us to turn to her often so that she may, through her intercession, liberate each one of us from the knots that seek to bind us and keep us from her Son,” she said. “It was not only an unexpected surprise but also a gift to all of us at the end of a very enlightening time in Rome during which we learned how the Curia serves the needs of the Pope and the mission of the Church,” he wrote in a reflection for his diocesan paper, The Catholic Sun. Schaffer said she was newly motivated in her studies after spending the week in Rome and meeting the many people who keep the Church operating.